As you know we are already discussed about walking for weight loss in previous article weight loss exercises and natural health care tips. The purpose of this content is to more explain about walking, because walking is the easiest and best exercise for weight loss. If you are trying to lose your weight, you should read some successful stories about losing weight. There are many stories are available on the internet you can search on the web about that stories, the best way of motivation to lose your weight is to read the stories about lose weight which is increase your morale and confident. There are many people in the world who get success with walking habit in our daily routine life. Only if you add half hour per day of brisk walking to your daily routine life then you could burn or eliminated almost 150+ more calories in a day. To lose a pound in a week, you should generally must to burn 500+ calories in a day. Through this, you can more walk and the quicker or rapidly your pace, the more calories you’ll burn. The word walk is described from the former English Dictionary which means wealcan “to roll”. When we talk about some person and other animal, walking is generally different from jogging in that only one foot at a time leaves contact with the ground while we are walking and there is a period of double-support. In contrast, running start when both feet are off the ground with each step of jogging. Speed is the factors which distinguish between walking and jogging or running. 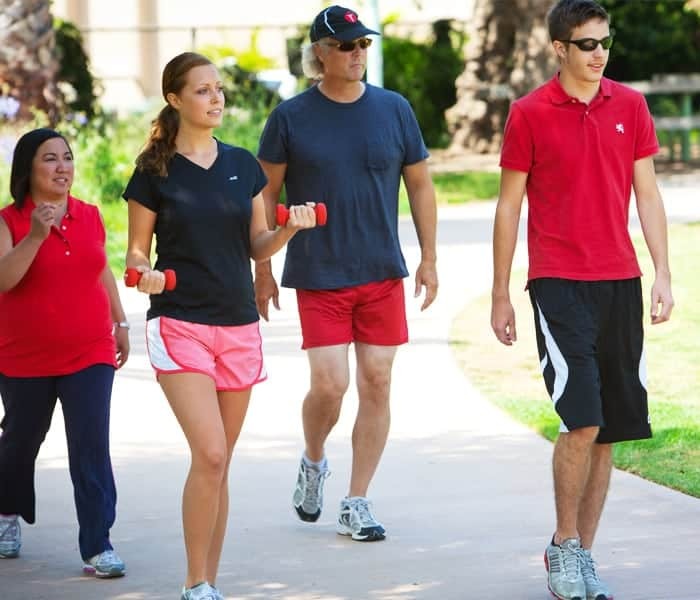 Walking speed is based on many factors such as height, age, weight and fitness of a person. If we talk about the normal average of walking speed then we can say that a normal person can walk 5 kilometers per hour or 3.1 miles per hour while a champion race walker average more than 14 kilometers per hour with the distance of 20 kilometers or 12 miles. Walking is not only loss your weight it may also be fruitful for your health and eliminate many disease from your body. Regular exercise of any kind can improve your body fitness, stamina, weight loss and increase life expectancy and decrease the stress from body. It can also be reduce the risk of heart attack, high blood pressure, cancer and osteoporosis. Through science we can see that many scientist prove that walking is best for physical benefits, it also beneficial for mind, increase memory skill, learning ability, concentration as well as ameliorating spirits. Many scientist has prove that walking for average 30 to 50 minutes per day with correct walking postures, reduce health risks and benefit for overall body such as bone health, prevent dementia and Alzheimer’s. Governments should recognize the benefits of walking for mental and physical health and motivating the people that take time of walking for weight loss. Growing emphasis on walking should arise because people walk less nowadays than previously. We can increase the percentage of people for walking through recognize different seminars and schemes in our country like British government conducted a program with the name of “Walking the way to health initiative” and also in united kingdom a health encourages program is conducted. There are some rules for walking for weight loss; you should follow these some instructions. Now days many persons are enjoy walking in the urban modern world, it is one of the best exercises. There are varieties of kind or types of walking like bush walking, race walking, beach walking, and hill walking etc. Some people are prefers to walk in a gym and fitness walkers. Many festivals and other walking events are conducted in many countries. The world’s largest walking event is the “International Four Days Marches Nijmegen” in the Netherlands.